Depart from the United States. Sleep on the plane. Arrive in Prague. Go on a walking tour of the city. We will see the Castle district with the cathedral, cross Charles Bridge into the old center, see the astronomical clock at the market square and end up at the Jan Hus Memorial, commemorating the first Czech Reformer. Hus died a martyr, but raised many of the same concerns that Martin Luther raised, only a century earlier. We will stay at a 3 or 4 star hotel in the heart of the city and enjoy a welcome dinner. We start our day with breakfast and Matins at the St. Michael the Archangel Lutheran Church, our mission church in Prague and head to Dresden. There we will see the Frauenkirche in Dresden. This church was restored after the Dresden fire bombings of World War II. The restored church stands as one of the great examples of church architecture influenced by Lutheran Theology. From Dresden we head to Wittenberg. Wittbenberg was the birthplace of the Lutheran Reformation. It is where Luther taught and posted the 95 Theses. We will have a walking tour of the town and visit the Luther Haus, the Old Latin School, Melanchthon House, and the two churches in town that were at the center of the Lutheran Reformation. Tonight we dine and sleep in Lutherstadt Wittenberg. After breakfast we get on the bus - Morning Prayer and devotion while we travel. We visit a number of sites today. First stop: Leipzig. This is where Bach served at St. Thomas Church as Kantor and where he wrote a Cantata a week for the Divine Service. We will also visit the Bach Museum go on a walking tour and see where protests which eventually led to the fall of the Berlin Wall. From Leipzig we head to Erfurt, stopping first at Eisleben, the birthplace and deathplace of Martin Luther. We spend the night in Erfurt. Here Luther lived as a student before he joined the Augustinian monks. 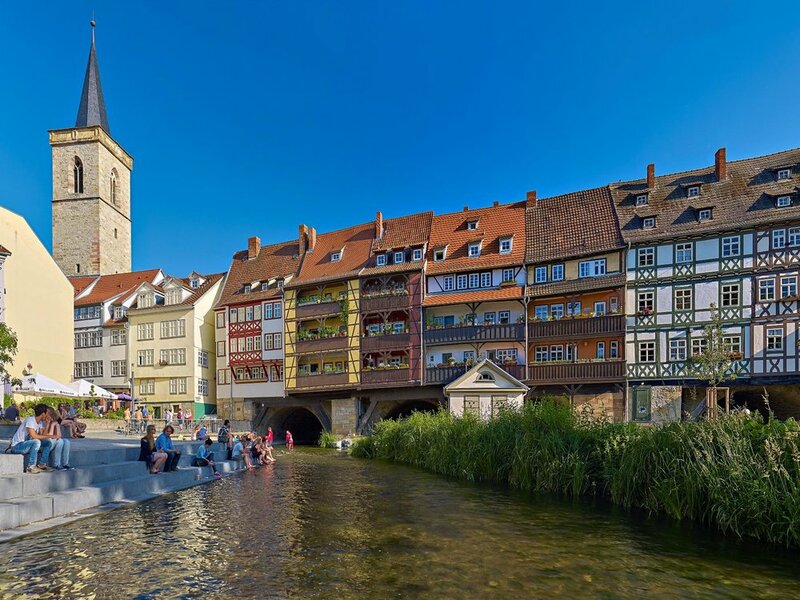 We see the market square with the magnificent cathedral, stroll through the little streets with the rich timber framed buildings, cross the merchant’s bridge, and visit the Augustinian monastery which Luther always called to be his spiritual home. Martin Luther joined the order of the Augustinians in 1505 when he was a student in Erfurt. While he was ordained in the Dom cathedral it was here that he celebrated his first Holy Mass. Luther always called the Augustinian monastery his spiritual home. Today the monastery is a church retreat center. We will visit a little museum in the monastery with Luther's cell. The church dates back to the year 1277. The glass windows are still pretty much original from Luther's time. They inspired Luther when he later designed his seal. We visit the Wartburg, one of the most important castles in German history. It is here that Martin Luther hid in 1521 and 1522, taking on the assumed name of Knight George, after being placed under an imperial ban. Among many letters and books he wrote here is the first translation of the New Testament into the German language. The Wartburg also is important for many other aspects of German history. On our tour we will be remembered to the life and work of St Elisabeth. And we will see the original black-red-golden German flag, used at a student’s meeting at the Wartburg in 1817. Eisenach is the birthplace of the famous composer Johann Sebastian Bach. We visit the museum and listen to a demonstration of Bach’s works on historical instruments. Rothenburg ob der Tauber with its timber framed houses and the medieval town wall surrounding the center gives us a pretty good understanding what a German town looked like in Martin Luther’s times. We enjoy a little free time on our own at our lunch stop, as we walk around the town and have a look into Käthe Wohlfahrt’s Christmas Museum. You may also visit the Medieval Crime Museum. This evening we go on the Night Watchman Tour, a truly memorable experience. We stay in Rothenburg tonight. King Ludwig II fancied himself as the German Sun King in the image of Louis XIV of France. To match the opulence of Versailles, Ludwig built three castles, the most famous of which is the Neuschwanstein Castle, which served as the inspiration for Disney's Cinderella Castle. On the way we stop at the Linderhof with its Hall of Mirrors, Venus Grotto, and surrounding park. In 1633 the black plague struck the town of Oberammergau. The residents made a promise to re-enact the story of Christ's Passion for all time every ten years. We arrive in Oberammergau in the morning. There are many shops to visit and sites to see. After lunch, we attend the Passion Play which is held in two parts. Dinner is held during the Intermission. During the play attendees may reference the play program which has the script in German and English. After the play, we retire to a hotel in or near Oberammergau. From Oberammergau we travel to the majestic city of Salzburg. Do you hear that? The hills around the city are alive with the sound of music! There is much to see and do in Salzburg. Overlooking the city is the Festung Hohensalzburg, a 900 year old castle accessible by a hike up the hillside or a ride in a Funicular (a rail car pulled by a cable). Birthplace of Mozart and the setting for the movie, Sound of Music, Salzburg continues to delight the ears of visitors who carry on the musical tradition. Enjoy a meal, or just a strudel at Central Europe’s oldest restaurant, Stiftskeller St. Peter, founded in 803 AD, or enjoy a beer and pretzel at the Augustinian Monastery. Finally, we head to Munich for our farewell dinner at the famous Hofbrau Haus where it is Oktoberfest all year round. After breakfast, we head home. Possible Alterations of Itinerary may include a stay in Sazlburg, home of Mozart and the setting for the Sound of Music. Participants will have the opportunity to give input on this tour's itinerary. Each day we will incorporate a brief service of prayer in the morning and evening. Included in the tour will be your travel booklet which will have travel notes and worship services. "in voce exultationis" - Latin for "with a voice of singing" which Isaiah 48:20 proclaims the joyous song of freedom of captives released from the Babylonian exile.